Veneers are a very clever invention to enable you to wave goodbye to discolored, or unsightly damaged teeth. They are thin layers of porcelain material, which are especially made to fit over the surface of your teeth. Kind of like how a false fingernail fits over your nail. Sometimes a composite material that is natural colored can be used to make veneers too. If you would like to improve the shape, colour, or position of your teeth then they can look great. You will be able to choose very precise coloured porcelain, to be able to improve on a single tooth that has been discolored in order to lighten the tooth. You will be able to fix a chipped tooth with a veneer, making it whole again. The material used covers the front of the teeth, and a thicker part is placed where the broken parts are. They can be used to close gaps in the teeth, when braces will not work. If one of your teeth is crooked, sometimes a veneer can be placed there to align it with your other teeth. Sometimes, you can opt for a mouth full of veneers. This is usually when teeth are very discoloured and damaged due to taking antibiotics as a child. Or, if you cannot get the desired look by using teeth whitening methods. A lot of celebrities have veneers fitted. They help to make your teeth look natural and a lot healthier. They are really thin, and held in position with very strong adhesive glue. You will not have to have a lot of work done before hand in order to prepare your teeth (or tooth) before the procedure. In some cases the veneers do not require any work before hand at all, and there will be no need to shave your existing teeth down in order to fit them. How Do We Prepare The Teeth For Veneers? Sometimes the shiny part of the enamel on the outside of the teeth is removed in order to bond the veneer. The enamel we remove is a tiny little bit, and it will be the same thickness as the veneer that is being placed on the tooth. This means that the teeth will stay the same size. Often an injection is administered to make sure that you do not feel any pain or discomfort during the procedure. Sometimes it is not even needed. Once your teeth have been prepped we will take a mould of them, and then the dental technician will make the veneer(s). 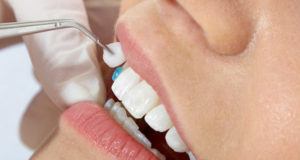 We will match the veneers to the surrounding teeth if you are just having one or two. If you are having a full restoration then you will be able to choose the shade you want. It usually means that you need two visits. The first one being the preparation time and making the shade of the tooth that you need. The second visit will be when we fit it. We usually show you the veneer before fitting it to make sure you are happy. When bonding the veneer(s) it is done with a special tooth adhesive and this ensures that it will stay in place. Once they are fitted, you will only be able to make minor changes. You will also need to make follow up visits just like you do with regular teeth. After fitting veneers they can last for years, they can break though, or chip- just like your natural teeth. The damage can be repaired, or replacements can be made and fitted. Why not make an appointment at VitaSmile today to talk to one of our specialised dentists about having your dream smile?